Your agent will guide you from your initial offer through your final closing, managing your transactional process. 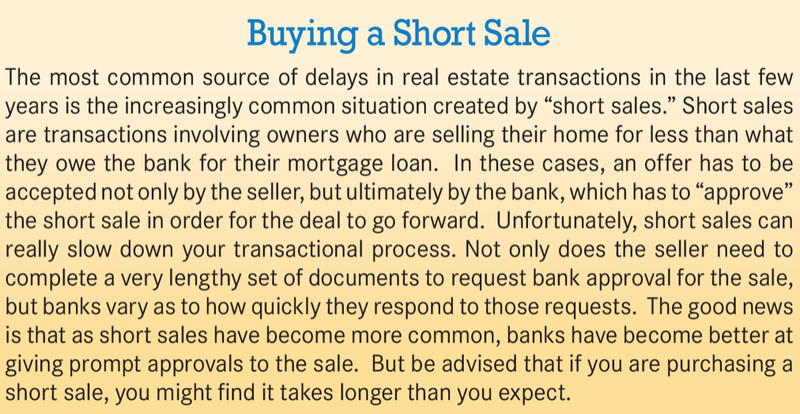 In the Guide, you’ll learn about all the different parts of the transaction, and how to avoid delays that would keep you from closing on time. You’ll also get advice about what to expect in your closing, and how to ensure a smooth moving process. Now that you’re at the transactional stage of the home buying process, you’re going to start having to work more intensely not just with your agent, but with all the members of your deal team. In this section, we discuss everything you need to know about the transactional process, and about how you can ensure the best possible experience in getting from accepted offer to closing. Once you have reached an accepted offer with the seller, the real work of putting together your transaction begins. This is when you’ll start interacting with your whole “team” of real estate professionals: your inspection engineer, attorney, mortgage loan officer, title representative, insurance salesperson, and everyone else charged with helping you put your transaction together. Indeed, the biggest challenge you’ll face during the transactional process is keeping all your balls aloft in the air. You’ll have a lot to do personally, and you and your agent will have her hands full coordinating the rest of the team to ensure that you’re moving closer to the closing table. In this section of the Guide, we’ll provide an overview of the transactional process, give you some idea of how long the process takes, and then discuss some common transactional problems and how you can avoid or fix them. •Inspection. Once you have an accepted offer, you will hire a licensed inspection engineer to go through the house to do an inspection, checking all mechanical systems such as the foundation, the roof, the electrical system, the air-conditioning and heating, etc. This inspection is usually completed within a few days of the offer being made, and you’ll review it with your agent before contracts are ordered so that issues can be resolved with the seller before any final commitments are made. •Contracts. In our area of the state, a seller’s attorney will prepare a contract and send it to the buyer’s attorney. These are usually fairly standard form contracts that the attorneys are used to working with. The seller’s attorney sends the contract, and your attorney reviews it and sends back comments or revisions, or even a “rider” adding terms to protect you. The attorneys then negotiate the legal terms, which are usually fairly straightforward. 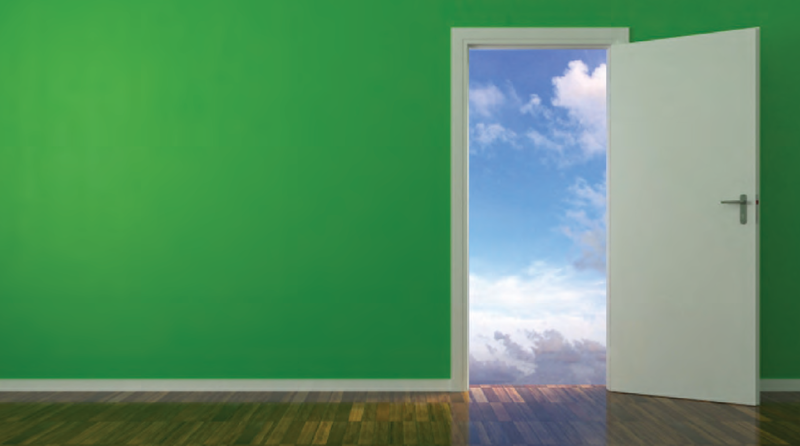 The only complications come from unusual situations: where sellers want to keep certain fixtures that would normally be sold with the house, setting out projected closing dates, etc. Contracts are usually finalized within two weeks of the accepted offer. •Mortgage. Once you’ve reached offer – and acceptance, and the attorneys are exchanging drafts of the contracts, you’re going to start working in earnest on your mortgage application. This can be a very difficult, time-consuming, and burdensome process, particularly these days where banks are ultra-careful about extending financing. You will need to gather a tremendous amount of documentation and submit it to the lender, who will then have to review it to determine whether it meets underwriting guidelines. This is usually the lengthiest part of the transactional process, because it takes time to coordinate the back-and­-forth of documents with your lender. It might take several weeks or even months to go from application to “clear to close” from the lender. •Title insurance. Once the contract is done, your attorney (or you) will order a title search from your abstract company to check for clear title, building violations, and identify the correct taxes. Once the report is done, your attorney will examine it to determine whether there are issues that have to be resolved by the seller. If all the problems are cleared, the abstract company will issue “title insurance” to protect you against claims against your ownership of the property. Title reports are usually issued within two or three weeks of ordering, so they usually come a few weeks after contracts are completed. If there are problems on the title, those could take weeks or months to resolve. •Home Insurance. At some point during this process, you’re going to need to order property and casualty insurance on your new home. Many buyers forget to do this, but your lender will require home insurance before finalizing your loan at the closing, because the lender wants to make sure that its loan to you is protected if, say, the house burns down while everyone is at the closing. It doesn’t take long to secure home insurance, usually a few calls to your insurance agent and filling out some forms, and it’s usually done in a matter of days, if not hours. •Closing. Once everything has come together – the mortgage is clear to close, the title report has been cleared of any problems, and the home insurance policy is all prepared – the attorneys will schedule a closing. If everything is ready to go, the only problem with scheduling the closing is finding a date when everyone is available: you, your attorney, the seller, the seller’s attorney, a bank attorney, a closer for the title company, and anyone else who is needed at the closing. All told, a reasonable estimation is that it generally takes two to three months to go from offer-and-acceptance to closing, mainly because it takes time to get through the mortgage and title process. The worst-case scenario is that you find problems on the title report, or if your lender has major issues with your loan application, which can cause months of delays. On the other hand, in the best­ case scenario, when you have a “clean” deal and all the professionals on your transactional team are working quickly, you can get cleared to close in less than a month. Every transaction is different. Some move smoothly from accepted offer to closing, with all the moving parts of the deal working together beautifully: the contract gets done quickly, your mortgage sails through, the title report doesn’t turn up any problems, and you’re ready to lose in a matter of weeks. Everyone loves doing these types of “clean” deals. First, only hire local professionals for your legal, mortgage, title, and insurance needs. Early in this Orientation Guide, we advised you to hire experienced, local professionals to be part of your “transactional team.” This is the point at which they can make a real difference. Local real estate attorneys are familiar with the standard form contracts used for transactions in your area. They know whom to call at the county clerks office to clear up problems in your title. They are likely to already have a working relationship with the local attorney on the other side of the deal, if the seller has also hired local talent, which can dramatically accelerate the formation of the contract and the resolution of any disputes that crop up afterward. Lawyers who work outside the area, or who don’t normally do real estate, will invariably cause delays in your deal. Similarly, don’t hire a lender who is from outside the area, or one who promoted some ridiculously low rate online, just because you think you’re going to save a few dollars. You’re not. Mortgage rates are not locked until very late in your transactional process, so those promises are easily (and legally) rescinded once it’s too late for you to make a change – or when a change is going to push your closing back for weeks or months! That’s why you should hire someone local, and experienced, and trustworthy to handle you loan. We recommend, of course, the professionals at our affiliation Hudson United Mortgage, because we believe that you can trust a mortgage loan officer who is under our supervision, and is accountable to us for the client service experience you’re going to have. But whatever you do, hire a local mortgage loan officer, and use a reputable lender. Ultimately, the choice is up to you. But it’s been our experience that when we have a real problem deal, and we investigate the source of the delays, we invariably find that the trouble was created by an inexperienced or out-of-market transactional professional. Be careful about who you put on your team. Second, be engaged, proactive, and responsive. As we’ve discussed throughout this Orientation Guide, you’ll have the best home buying experience if you are engaged throughout the process. You have a real estate agent who will be working hard coordinating all the moving parts of the deal, but at this stage of the process, you’re the only one who can do some of the work that needs to be done. •Be engaged. As always, you need to be engaged in the process. Don’t sit back and assume that all the players on your transactional team are going to get the job done. You’ll feel much better about the process, and far more in control, if you stay active, involved, and in touch with what’s happening with your deal. •Be responsive. The most common source of transactional delays come from the mortgage end, which often results from buyers who are not immediately responsive to follow-up document requests from their lender’s underwriter. If you want your deal to move quickly, then immediately respond when you get requests for information from your lender, your attorney, or any of the other professionals involved in your deal. At this point in the process, an engaged, proactive, and responsive buyer (or seller) can really move a deal forward, particularly when you’re working with a strong transactional team. This way, even if problems crop up, you’re in a good position to try to resolve them quickly and avoid unnecessary delays in your closing. •Keep a transaction folder for all your documents. Keep all your deal documents together: all your mortgage forms and follow-up documentation, your real estate contract, and anything else that you get relating to the transaction. If you are tech-savvy, you might even consider scanning everything you get related to the deal, and keeping it on your computer so you can access it easily and send it around if someone else needs it later in the process. •Create a separate email folder. Any modern email system allows you to create folders where you can dump any email that relates to your t ransactio n. Some even allow you to set up “smart folders” that will divert all incoming email from particular senders (like your agent, your attorney, your loan processor, etc .) into the folder. That’s a great way to keep all your deal email segregated, so that you don ‘t have to hunt through your overflowing general inbox to find important transactional information. •Keep a transactional project plan. As you have probably figured out by now, we’re big on project plans, which are the cornerstone of the Client-Oriented Real Estate (“CORE”) philosophy that we follow at Better Homes and Gardens Rand Realty. Project plans are really just collections of checklists of “to do” items that we codify in order to ensure an attention to detail and consistency of execution. You can do the same thing for your deal. Keep a master “to do” list of everything that has to be done for your transaction, not just by you but by everyone on your transactional team. That will help you focus on what needs to get done, and give you a better chance of actually doing it in a timely fashion. Staying organized is not only great for helping you get things done, but it also makes you feel more in control of the whole process, which will make you feel better. The happiest clients we have are the ones who feel like they know what’s going on, and are in control of their own deal. •Finally, take a deep breath and relax. No matter how engaged you are, regardless of how great all the members of your transactional team are, you’re almost certainly going to hit a snag in your deal. 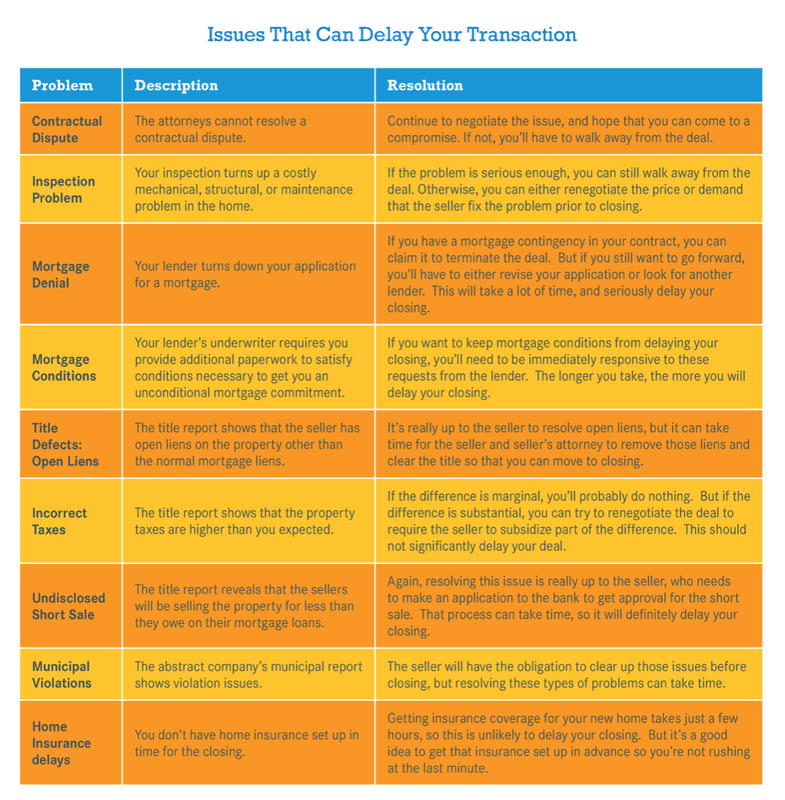 Real estate transactions are tricky things, with a lot of moving parts, and delays can come from anywhere. The key is to be as prepared as possible for the problem, so that the delay is minimal. And no matter what happens, try not to get too stressed out. 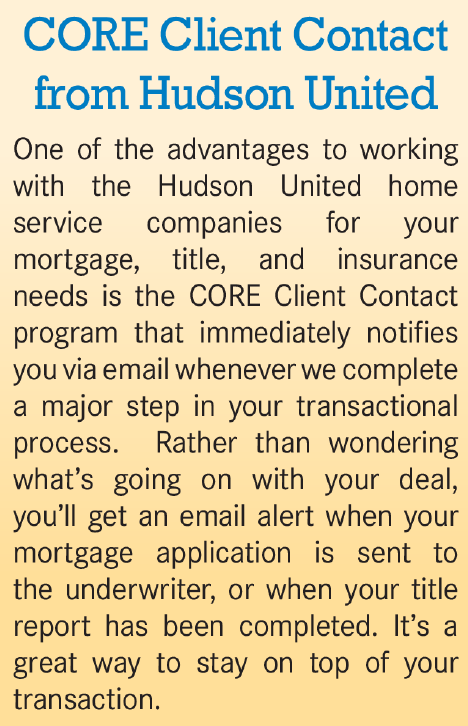 For more information about the mortgage, title, and insurance parts of your real estate transaction, and how about how to smartly avoid delays that could put off your closing, make sure you get the Hudson United Orientation Guide available from your real estate agent or Hudson United rep. The Hudson United Orientation Guide will explain everything you need to know about the mortgage application process, review the potential problems that can come up in your title report, and give you a complete overview of the home insurance choices you’ll be making.